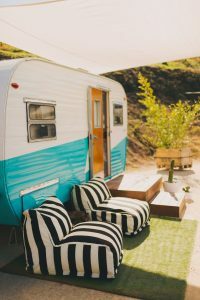 Glamping, a combination of glamor and camping, comes in many forms. Perhaps a deluxe tent, yurt, treehouse or even a cave. 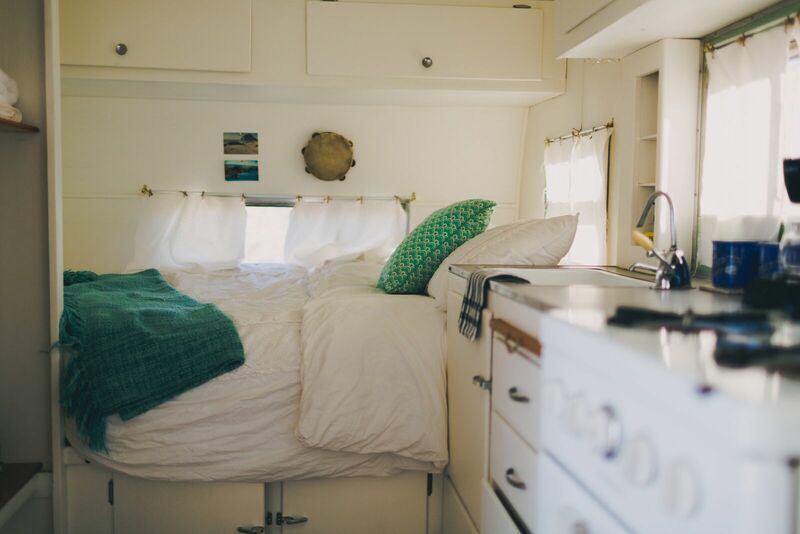 Some may consider glamping to be camping with full amenities such as a bed, furniture, heaters and even foot warmers. Some consider a van parked along the edge of a cliff their idea of glamping. 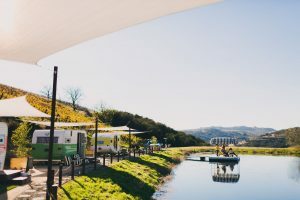 Now one Adelaida District Winery in Paso Robles, California is offering a wine-focused twist on the glamping experience with retro trailers in the vineyard. 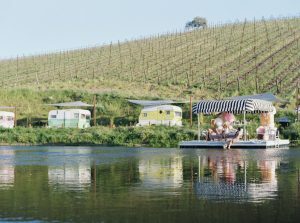 Trailer Pon d and Alta Colina Winery offer a unique vineyard experience in fully refurbished and decked-out 1950’s trailers taking glamping to a new level. 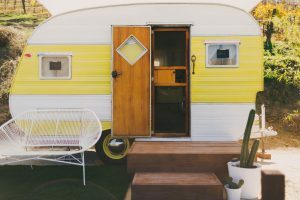 Both companies were recently awarded the Sunset Magazine’s Best of the West Travel Award, honoring the top game-changing, stylish destinations and experiences across the thirteen US western states, British Columbia, Alberta, Canada and Western Mexico. Alta Colina Winery was the only winery in California’s central coast honored with the award. Alta Colina Winery, owned by Bob and Lynn Tillman and operated with daughter, Maggie Tillman, fully participates in the entire experience. Guests check in at the Alta Colina tasting room, enjoy a complimentary tasting of estate wines and then make their way to their accommodations. 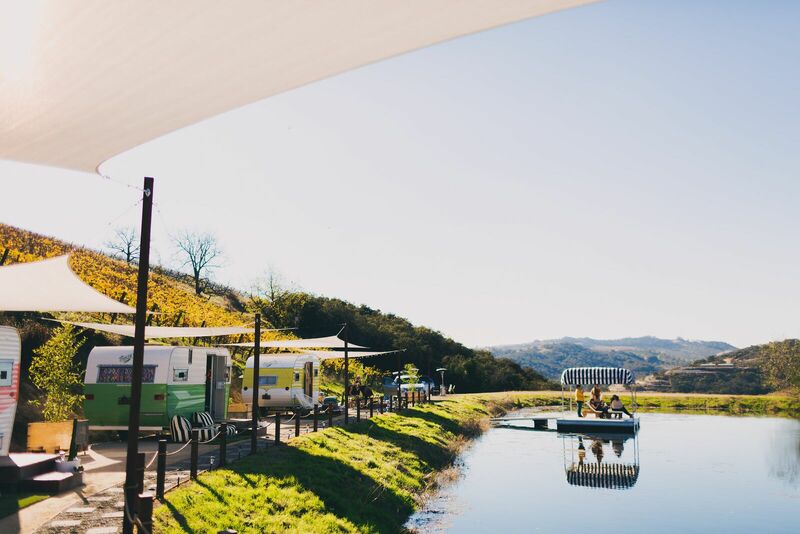 Enjoy a wine blending class or a yoga class among the vines. If you enjoy hiking, they encourage you to walk the vineyards. Tinker Tin Trailer refurbishes the trailers and offers services beyond overnight rentals, like photo booth trailers and bar trailers. 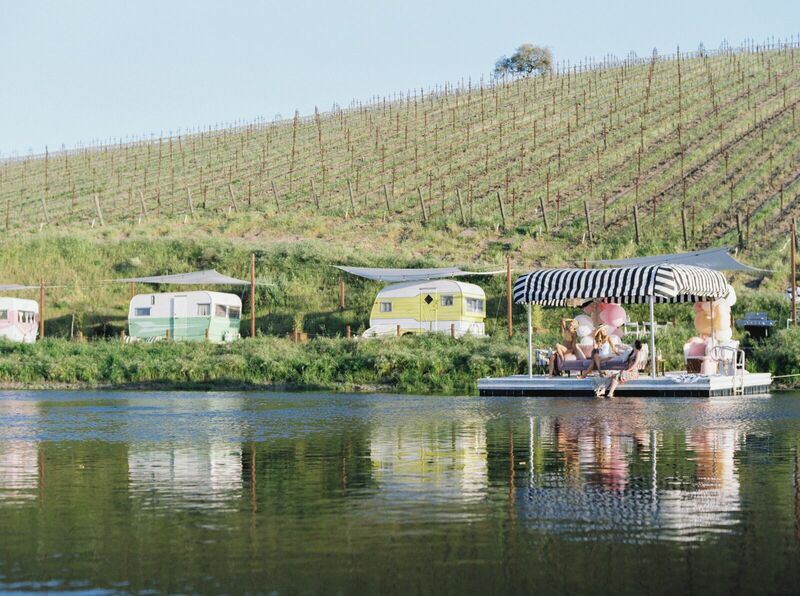 The Holm’s have set their five trailers alongside a pond in a secluded section of the winery. Each trailer’s doors face the water and offer covered seating areas to relax with a book or a glass of wine. Other amenities include Tempur-Pedic mattresses so that you wake up refreshed, functional cooking burners, a refrigerator or an ice box, a fan and a heater. The compound has a communal kitchen, shared restroom and access to the pond seating area. 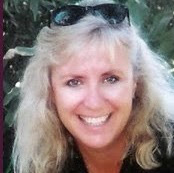 “Guests frequently cook at the Pond one night and enjoy one of Paso Roble’s great restaurants on the next,” Maggie explained. “However, if you‘d like you can order a catered meal at the pond.” Now that’s a great idea! The vineyard pond beckons guests on a warm Paso day. A covered swimming platform with two lounge chairs awaits cocktail hour or sunset watching or just plain relaxing. If its peace and quiet you crave, you’ve come to the right place. Alta Colina Winery organically farms 31 acres in the Adelaida District, the northwestern most region of Paso Robles in the Santa Lucia Mountain Range. Just fourteen miles from the coast, the region’s high elevation, mild temperatures and shallow soils are ideal for growing a wide range of grapes. The Tillman’s focus on Rhone varietals with eight different varietals: four whites, Viognier, Roussanne, Marsanne and Grenache Blanc. Their four reds are Syrah, Grenache, Mourvedre and Petite Sirah. They produce seven core wines from the estate plus one or two small lots that show off a different side of the vineyard. Core whites are Grenache Blanc, 12 O’Clock High Viognier and Claudia Cuvee Marsanne. Core reds are GSM, toasted Slope Syrah, Old 900 Syrah and Ann’s Block Petite Sirah. To fully enjoy your visit, you must venture out to other wineries in the Adelaida District. With 47 wineries in the area, make sure that you make a plan. The top Varieties found in the district are Syrah, Mourvedre, Grenache, Viognier, Zinfandel and Pinot Noir. Wake up in the vineyards!